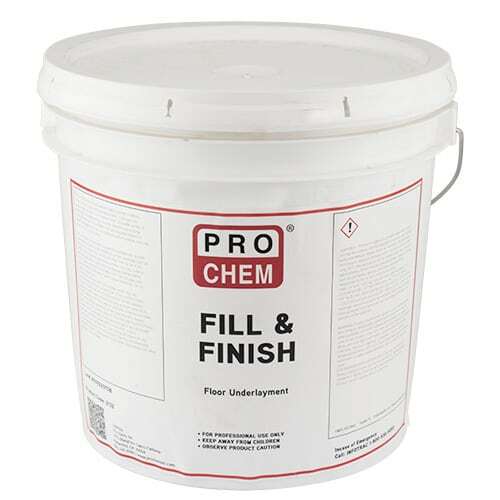 FILL & FINISH | Pro Chem, Inc. FILL & FINISH is a trowel applied, highly polymer modified, cement-based, rapid setting underlayment. It provides an exceptionally smooth, true “feather finish” to a wide variety of substrates, including wood, concrete, ceramic and existing resilient flooring. FILL & FINISH can also be used indoors to repair damaged concrete wall surfaces and on exterior concrete walls that are to be coated. FILL & FINISH can be used to create an exceptionally smooth underlayment prior to the installation of floor coverings such as carpet, VCT, sheet vinyl, wood and other flooring surfaces. Coverage Rate: Estimating Guide – Approximately 30 sq. ft .at 1/8 in. thickness per 10 lb pail. Approximately 250-300 sq. ft ./10 lb. pail for skim coating, depending upon the type and porosity of the substrate. Substrate texture and porosity will influence the actual coverage rate. NOTE: For horizontal applications, interior use only. Exterior vertical applications must have a protective coating applied. Do not apply at temperatures below 40° F. Do not apply over gypsum-based substrates or water-based adhesives. Do not use as a wear layer. Prepackaged material segregates while in the pail, thus when mixing less than a full pail it is recommended to first agitate the pail to assure it is blended prior to use.